The UK has an abundance of exciting music festivals such as Glastonbury, Great Escape, Green Man, Isle of Wight festival and many more. These outdoor festivals often span over a few days and attract a large group of people who watch Adele battle it out with Coldplay and Muse for the best headline performance. Music festivals are an integral part of British culture and provide the best environment for fans to dance to the tunes of their favourite hip hop, rock or pop music stars. As they dance to the soothing tunes from the headline and upcoming acts, it is vital you’ve made adequate provisions for portable toilets to ensure their entire festival experience is in rhythm. 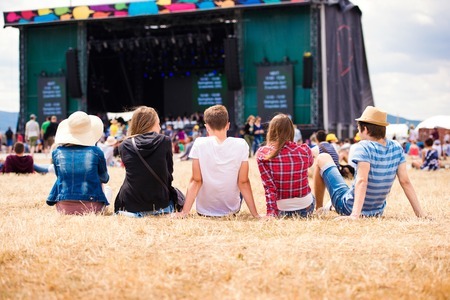 For festival organisers, choosing quality lavatories and the appropriate quantity is always an important part of the event organisation process. Having adequate portable toilet facilities around the festival ground prevents revellers from urinating in public areas. When festival goers urinate in public spaces the beautiful farms become polluted and this causes a threat to the existence of fish and wildlife in the streams. We supply portable toilet units to a variety of festivals in the United Kingdom. Our vast experience in supplying clean and high standard restrooms ensure we promptly supply, empty and replace these toilets to ensure the festival experience is remarkable. These portable toilets are supplied with recirculating chemical flush and hand sanitizers to prevent the spread of germs. It is also important that the portable toilets are structurally strengthened for manual holding and are very stable whilst in use. Your festival attendees can even benefit from the coat hook and mirror provided in these facilities.